KABUL: In the wake of ongoing peace talks that already gained momentum, the US Special Envoy for Afghanistan Reconciliation Zalamy Khalilzad expressed his rage over so-called Taliban’s spring offensive announcement, terming it “reckless” and “indifference” to the demands of Afghans for peace. “The Taliban’s spring offensive announcement is reckless. It is irresponsible to suggest that an increase in violence is warranted because the government announced a security plan. 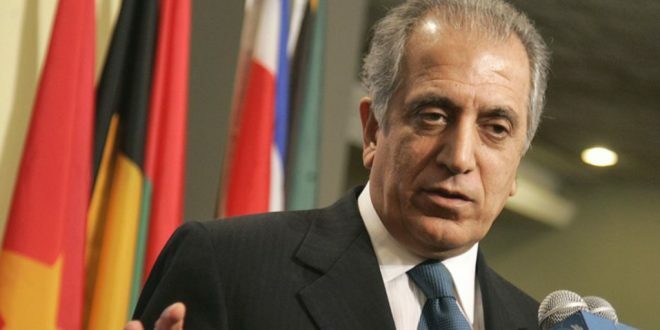 The Afghan people have clearly voiced their desire for peace,” Khalilzad, who held fifth round of talks with Taliban members in Qatar to end the decade-long wars, has said in a twitter message. “Through this announcement, Taliban leaders demonstrate their indifference to the demands of Afghans across the country. The call for more fighting will not advance peace efforts. If executed, it will only yield more suffering and thousands more casualties,” he added. He also furthered that the US and its international partners will stand with the Afghan security forces to continue our effort to end the war in Afghanistan, at the same time as we seek to bring parties to the table of negotiate peace. “The killing of Afghans must stop. All sides must end unnecessary violence, and instead engage in intra-Afghan dialogue which leads to negotiations on a political settlement and a roadmap to end the war this year. Afghan people want peace, and the US stands with them,” he concluded his tweets. The government of Afghanistan also condemned Taliban’s announcement of yet another offensive which is an indication of Taliban’s hawkish attitude to prolong their illegitimate war. Taliban announced their offensive while the Afghan government has stepped up its efforts for peace to end the imposed war on Afghans, and the U.S. Special Envoy for Afghanistan Reconciliation has been engaged in direct talks with the insurgent group, Presidential Palace said Saturday in a statement. “Taliban erroneously claim that their announcement is a reaction to the government’s utterance of declaring an offensive. Not only has the Afghan government not announced any combat operation, it has removed all obstacles to a peaceful settlement and considers war not in the interests of any party,” the statement added. On the contrary, through their insurgent operations the Taliban have not only brutally terrorized innocent civilians at the command of others, but also against all Islamic values and Afghan traditions, violated dwellings of our innocent citizens, have taken kids and women hostage, and used them as human shields, and their houses as bastions, it added. “The Afghan government calls on all Afghans, who fight in the ranks of Taliban, and are used as cannon fodder by the tyrannical Taliban leadership and their regional patrons, to denounce Taliban’s ranks and abstain from terrorizing and killing their fellow Afghans. The Afghan government also calls on those Taliban leaders who oppose the war, to stand with their fellow Afghans and voice their opposition against this unlawful war,” the statement added. Taliban insurgents on Friday announced their spring offensive where so far they carried out 90 attacks in 25 districts of different provinces.